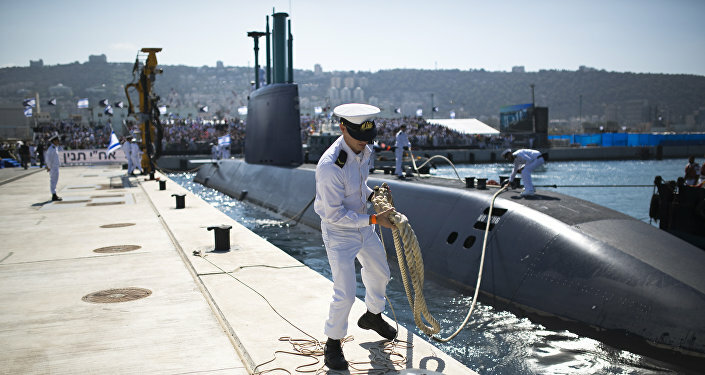 An Israeli news outlet reported Friday that an Iranian government company has a 4.5% stake in ThyssenKrupp Marine Systems, the German submarine company involved in a controversy over a recent weapons deal with Jerusalem. More than a week ago, investigations began in both Israel and Germany after Attorney General Avichai Mandelblit ordered police to conduct a probe into a possible conflict of interest involving David Shimron, personal attorney and distant relative of Prime Minister Benjamin Netanyahu. The police inquiry centers on accusations of Shimron leveraging his political relationship to convince the Israeli government to let the company build a shipyard in Israel, purchase several submarines and award the corporation a contract for naval vessels. It was also revealed that Shimron was representing Israeli businessman Miki Ganor, ThyssenKrupp’s representative in Israel. Reports have Ganor possibly receiving between 10 and 30 million euros for acting as an intermediary on the submarine agreement. According to the Times of Israel Hebrew-language newspaper Yedioth Ahronoth reports that Tehran invested some $400 million in ThyssenKrupp during the reign of the Mohammad Reza Pahlavi as Shah in the 1970’s. The conglomerate was focused chiefly on elevator, steel and automotive programs at the time, instead of submarines. It was not until the conglomerate acquired the Howaldtswerke-Deutsche Werft shipbuilding company in 2005 that the corporation became the German "sub king." Iranian investments in ThyssenKrupp were made through the Iran Foreign Investments Company (IFIC), and the country’s investment was so considerable that, at the turn of the century, IFIC deputy economy minister Mohamad-Mehdi Navab-Motlagh sat on the corporation’s board, only being removed after Washington threatened to blacklist the company. As a result, ThyssenKrupp was forced to buy 17 million shares from the IFIC at 400 million euros, nearly twice their original value, reducing Tehran’s stake from it’s original 24.9% to 4.5. IFIC’s managing director Dr. Farhad Zargari told the Business Year website that, "We own shares in important companies such as British Petroleum, ThyssenKrupp, Siemens, Adidas, and many other big brands," and that, "One of IFIC’s significant roles is to create a bridge between Iran and other countries with our investments, in order to pave the ground for knowledge and know-how transfer." "We feel more secure investing in European and other developed countries compared to less regulated countries," he added.